Bored of the monotonous city life, we often look for places that add a tinge of freshness to our routine. This staycation villa in Aundholi does that for you. With beautiful surroundings and great hospitality, Dream Villa is every wanderer's paradise. The villa's beautiful surroundings and amazing interiors make it completely Instagram-worthy. 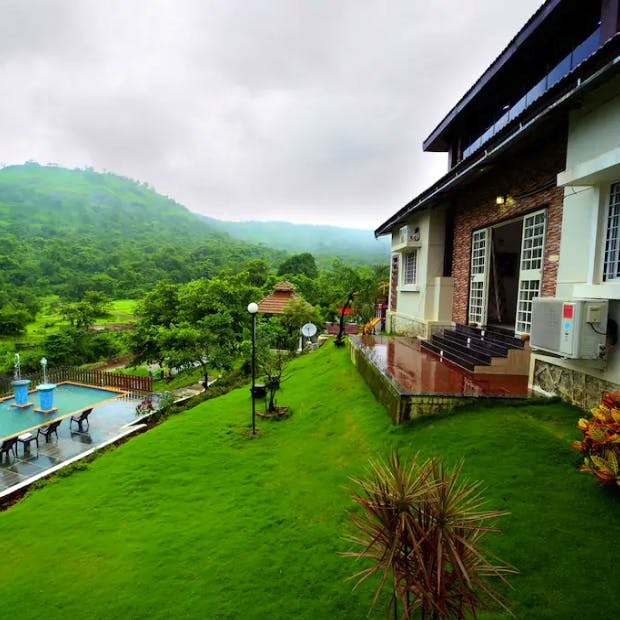 The sprawling property which is surrounded by waterfall view, Pawana back water lake and lush mountains, is ideal for group picnics, get-together and pre-wedding shoots. What we love is that the stay will not weigh heavy on your pockets as every person will be charged a mere INR 2500 for one night. Got a small function to host or any pre-wedding event? The place has an 80,000 sq ft lawn with a separate play area for kids. The space is such that around 25 guests can be accommodated. We love that the property is pet-friendly and you can get your fur-buds here to chill! We found it a bit difficult to trace the location as the address did not exactly match to the one mentioned on the Airbnb site. For a full refund, cancel within 48 hours of booking. If you cancel seven days prior to your check-in, you will be eligible only for 50% of the refund minus the service fee.